Bill is recovering after an open–heart surgery. But without the support of friends like you, this local retiree would have no other way to get the nutritious food he needs to heal and maintain his health. Bill, 82, spent 20 years working as a chemist and several more years in management. But ever since he retired, it’s been difficult for Bill and his wife to make do, especially with endless medical bills. “I get my Social Security check, but it’s not enough to live on,” Bill says. Bill has diabetes and heart disease. His prescription costs alone are expensive, so affording healthy groceries is challenging. And though Bill has tried to find other financial assistance, like the Supplemental Nutrition Assistance Program (SNAP), the couple’s income is just high enough not to qualify. 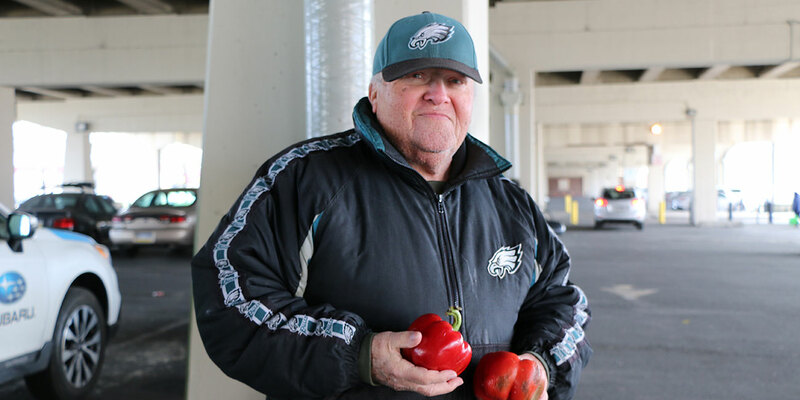 That’s why it means so much to Bill and his wife to receive groceries from the free produce market in South Philly. Bill had to sell the couple’s only car recently, so they’re especially thankful that the free market is close to their home. Through your support, Bill can bring home fresh produce like peppers, tomatoes and other fruits and vegetables he and his wife would otherwise be unable to afford. “Thank you,” he says to donors like you who make it all possible. Your generosity supports our shared mission to help feed seniors like Bill and his wife!